Why Sudanese-Born Singer Alsarah Calls Her Music 'East-African Retro-Pop' : Goats and Soda Please, says the singer-songwriter, don't pigeonhole her as some sort of "refugee artist." 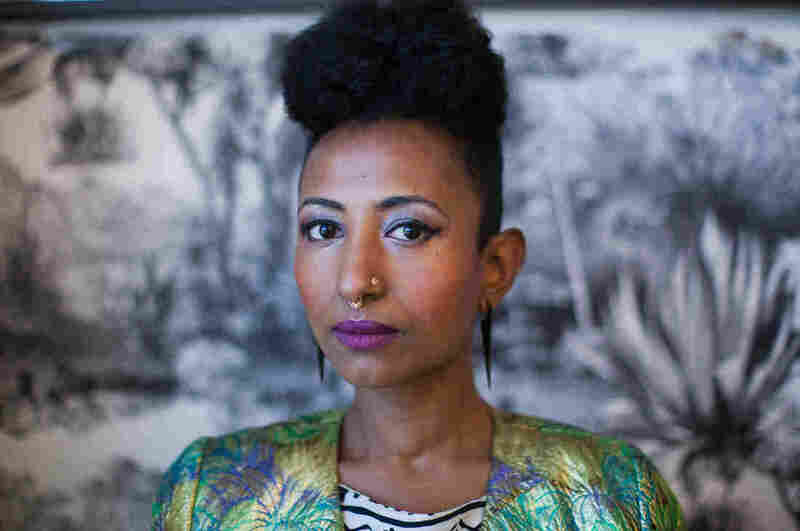 She calls her music "East-African Retro-Pop." The singer Alsarah: "Sudanese people said I wasn't Sudanese enough. Arabs said I wasn't an Arab. Americans said I wasn't American. I used to be like, 'I don't belong anywhere! Now I'm like you're all mine. All my countries, you're all mine." Alsarah was born in Sudan to politically active parents. When she was still a child a coup there forced the family to flee to Yemen. Then, after civil war broke out in Yemen, they had to flee again, this time to Amherst, Massachusetts — all by the time Alsarah was 12. But please, says the singer-songwriter, don't pigeonhole her as some sort of "refugee artist." "I was a refugee coming in. I know what it feels like when you first land somewhere and you don't have any of the resources, you don't know the system," she says. But she notes that this was a long time ago. "I've had all these other phases of identity happen since then." Today she's the lead singer of Alsarah & the Nubatones, a Brooklyn-based band that's just released their second album Manara. And yet for Alsarah — who goes by one name — her personal journey is unquestionably at the heart of her sound. "Absolutely," she says. How to define it then? "I like to call it East-African Retro-Pop," she says, laughing. Pop because of the undeniably contemporary take she brings to the music. East African because of the Sudanese — and Egyptian and Kenyan — influences. She sings in Arabic and draws from the region's instruments, melodies and rhythms, with a particular emphasis on her Nubian roots. And retro? Well, that's because of the deep nostalgia that runs through every song. You hear it in the music, which takes inspiration from Arabic-language hits from the '30s through the '70s. "I'm creating a pop sound that has an old-timey feel — without it being traditional," she says. Her look reflects this too — combining vintage dresses, cat-eye makeup and a sort of Afro-bouffant hairstyle with a distinctly modern, even punk, sensibility. But the sense of yearning, a kind of ache for places that no longer exist, is perhaps most clearly felt in Alsarah's lyrics. Take the first number in the set from the group's NPR Tiny Desk concert, the original song "Ya Watan." "Ya Watan means 'Oh Homeland,' " Alsarah says. The chorus, she explains, translates as, "Where is the time? Where is the homeland? Angry with the years that stretch back and throw pain in its face." "For me it's about issues in Sudan from the moment I left it and how that is still so relevant. It seems to be just ricocheting everywhere today. You know, I feel like I'm watching everyone go through what happened to Sudan in 1989. The collapse of government, the coups. It just feels like it never stops." The song is also about trying to make peace with what has happened. "It's like a lament to a love lost — and accepting that love lost," she says. "I think I'm trying to reconcile myself. Like how can I love being Sudanese and hate being Sudanese at the same time?" Alsarah strikes a pose. She calls her music "East-African Retro-Pop." It's Alsarah's twist on a Nubian myth she grew up hearing as a child in Sudan. "The [original] story goes that the Nile River floods every year because the River God was lonely and angry," she says. "And so every season Nubian people would sacrifice the most beautiful maiden in the village to be the bride of the Nile God." She must enter the river never to return. But even as a kid, Alsarah says, the story didn't sit well with her. "I was always like, 'Wait! What? That's the end? She just goes into the river?" What happens to the maiden afterward, Alsarah wondered. And so she decided to re-imagine the myth. In Alsarah's version, after the maiden's three months with the River God, she is free to leave and make a life for herself with the other former brides. "These women just swimming around in this big kingdom under the sea, all magic and basically like psychedelic versions of Nubian mermaids," says Alsarah. This refashioning of all the parts of her life, of her identity, into her art has been healing, she says. Growing up in an almost entirely white rural community in Massachussetts, she felt a kind dislocation common among immigrant kids. "It's the trauma of trying to explain yourself to yourself — and to your family and to the outside world. All the different personas you end up taking on," she says. "I wasn't from any one place any more. Sudanese people said I wasn't Sudanese enough. Arabs said I wasn't an Arab. Americans said I wasn't American. I used to be like, 'I don't belong anywhere! Now I'm like you're all mine. All my countries, you're all mine."